We’ve all been counting down the days here at Turning Technologies, so I’m thrilled to announce that TurningPoint web is finally here! A web-based version of our TurningPoint software, this platform automatically saves results online and gives instructors the freedom to provide interactive content both inside and outside of a classroom or meeting. It also allows you to poll in PowerPoint or directly on the web and to schedule surveys and assessments, while participants respond using either mobile devices or clickers. 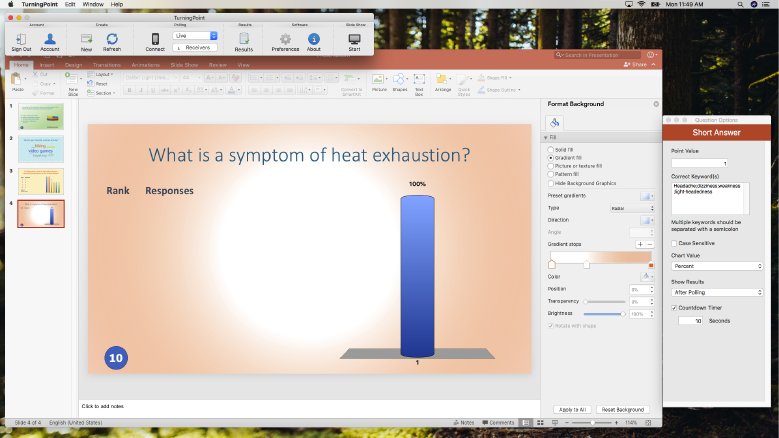 PowerPoint Polling with TurningPoint web is one of the platform’s most prominent features. 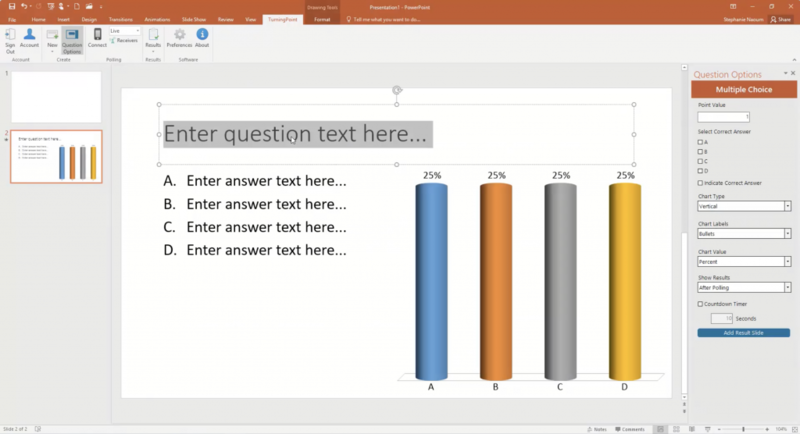 This is the same direct PowerPoint integration that our clients know and love with the same great interactive polling capability. However, it is a lighter, easier-to-use version with a cleaner interface. The most exciting part of this platform is that it will automatically save your results while you are polling, and then automatically send those results to your account where you can access them anytime, anywhere. If you work in Higher Education, think about when your lecture ends: you typically spend time saving your files and ensuring their proper location all while answering last-minute student questions, logging off the computer and packing up your bag before the next class arrives. 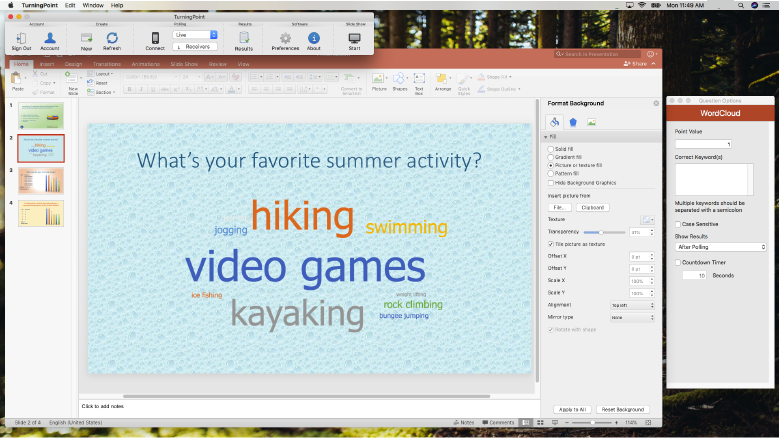 TurningPoint web for PowerPoint allows you to focus on what is important: your students. You can exit the software immediately after class with the comfort and confidence that your student results will be safe and waiting for you in your account whenever you have time to access them. In the corporate world, time is just as precious, with groups often waiting impatiently outside of a conference room once your meeting or training session is over. TurningPoint web ensures that you will not have to worry about taking the time to save your session, or risk losing your results, during a rushed situation. TurningPoint desktop is robust and feature-rich. This is perfect for some of our clients. However, not every user is going to need or even want all the bells and whistles. For TurningPoint web for PowerPoint, we took the question types that are most commonly used in our desktop software and only included those in this platform. 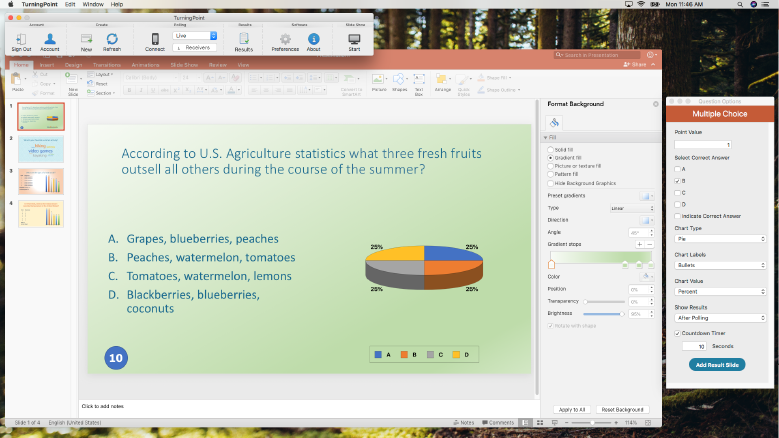 This makes using the software even more intuitive, and reduces the learning curve so that you can get started creating and running presentations right away. Want to learn more? Check out our product page or request a free demo!